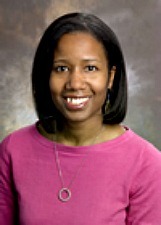 Stacy Higgins, MD, associate professor in the Department of Medicine at Emory University School of Medicine has been awarded the 2014 American College of Physicians (ACP) W. Lester Henry Award for Diversity and Access to Care. The prestigious award is given to an ACP member who has demonstrated outstanding accomplishments in advancing diversity in clinical medicine or research, and access to care in relation to diverse populations. This encompasses economically or socially disadvantaged patient populations and groups underrepresented in the healthcare workforce. Established in 2008, the award was named in honor of Dr. W. Lester Henry, the first African-American Regent and Master of the ACP in 2012. Dr. Higgins graduated from Dartmouth College with a BA in Psychology in 1989 and received her medical degree from Cornell University Medical College in 1995. She completed her Internal Medicine residency followed by a year of Chief Residency at Columbia Presbyterian Medical Center in New York. Dr. Higgins joined the Emory School of Medicine faculty in 1999. Based at Grady Memorial Hospital, her talent and leadership in medical education were quickly identified. Dr. Higgins was appointed associate program director for Ambulatory Medicine and then director of the Primary Care Residency program. Recognized as a master teacher with a patient-centered approach, Dr. Higgins has helped shaped the educational experiences for countless medical students and residents, earning many teaching awards along the way including the ACP Georgia Chapter J. Willis Hurst Bedside Teaching Award in 2010. Through her work, Dr. Higgins has made enormous contributions in promoting physician diversity and improving access to care for minority and non-English speaking patients. In her role as director of Minority Resident Affairs, Dr. Higgins has been instrumental in attracting under-represented minority physicians into internal medicine and primary care specializations. In 2002, Dr. Higgins founded the Women's Clinic within the Grady Primary Care Center, providing preventive care for female patients who previously had limited access to these services. As a bilingual physician Dr. Higgins recognized the many challenges faced by Georgia's rapidly growing Hispanic population and co-founded the International Medical Clinics (IMC) at Grady Hospital. In collaboration with Morehouse School of Medicine, Dr. Higgins has helped catalogue information on physician language fluency to help meet the communication needs of the patient population served by Grady. In collaboration with state and county health departments, this clinic provides medical care for refugee families. "I am extremely humbled to be honored with this award from the American College of Physicians," says Higgins. "I consider it a privilege and honor to care for our city's most vulnerable and often underserved patients."